Natural cotton jute mesh comes up with an elegant look at the party or some special celebration. With the use of this classy fabric, you can actually embellish the surroundings by adding this material to the floral arrangements. The natural cotton jute we offer is easily available in a variety of shades. Therefore, shopping with BB crafts is the best thing as here the customers can enjoy great benefits with the best ever discount deals and exciting offers on bulk purchases. Here, the best part is that, if you buy more, you can save more. The cotton jute we provide is extremely soft and holds the finest quality creation. Well, if you are planning to buy it all in bulk, then we can easily provide you the same in wholesale. The cotton jute we are offering is completely environment-friendly. The next best fact about this product is that it created with a fiber that is non-biodegradable. 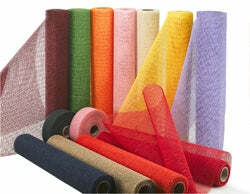 Moreover, these jute rolls can be re-used and require zero maintenance. Ultimately, shopping with BB crafts will always be beneficial for you as they sell on affordable rates.